“I’m calling on Premier Ford to cancel expensive plans to rebuild outdated nuclear plants when Quebec has low cost water power available. The Liberals failed to choose low cost energy solutions, and the Ford government should not make the same mistake. According to the Ontario Energy Board, nuclear power is responsible for 40% of the rise in the Global Adjustment payments that are increasing the cost of electricity in Ontario. Keeping Pickering open past its best-before date will cost Ontario $1.1 billion per year, while the Darlington rebuild is estimated to cost $13 billion, which will drive electricity costs up from 8.2 cents per kWh to 16.5 cents per kWh. In 2017, Hydro Quebec offered Ontario a twenty-year supply contract at a price of 5 cents per kWh, which is less than one-third the projected cost of rebuilt nuclear in 2025. 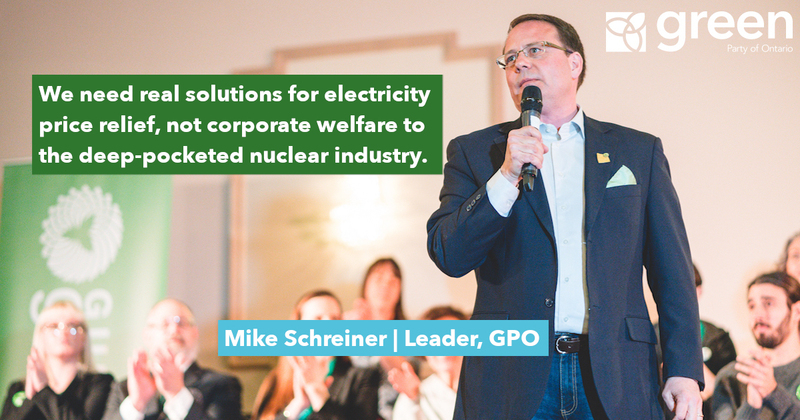 But just like the Liberals, Premier Ford continues to bend to the will of the nuclear lobby. The people of Ontario will be the ones bearing the costs of the Premier’s decision. We need real solutions for electricity price relief, not corporate welfare to the deep-pocketed nuclear industry. We should not lock ourselves into high-cost nuclear at inflated future prices when there are cheaper, cleaner options available.